While the re-imposed sanctions have a biting effect on Iran’s economy and negatively impact the relief envisioned by the nuclear deal known as the Joint Comprehensive Plan of Action (JCPOA), the Nov. 5 announcement could have been worse. The Trump administration did not realize its goal of pushing Iran’s oil exports to “zero,” or as close to zero as possible, ahead of the Nov. 5 deadline and issued waivers that allow states to continue purchases, a tangible benefit for Iran. Additionally, after President Trump described the JCPOA as “horrible” and claimed it paves Iran’s pathway to nuclear weapons, the administration said it will exempt critical nonproliferation projects from sanctions, finally acknowledging that implementation of the deal “enhances our ability to constrain Iran’s nuclear program,” according to a State Department release. On the negative side, SWIFT, the Brussels-based financial messaging service used by banks worldwide, caved in to U.S. pressure and severed ties with Iranian banks as a result of U.S. returning most banks in Iran to the U.S. sanctioned list. This will make it more difficult for other countries, including close U.S. allies, to conduct legitimate trade with Iran. More detail on each of these three areas – oil, nonproliferation projects, and SWIFT – are below. While Trump continues to argue that U.S. sanctions will pressure Iran into a “better deal” that addresses not only the nuclear program, but also regional and ballistic missile activities, sanctions work best when paired with a realistic, credible diplomatic off-ramp – something the Trump administration has failed to articulate. Trump’s approach is only isolating the United States and putting the future of an effective, verifiable nuclear agreement with Iran in jeopardy. It was clear ahead of the Nov. 5 announcement that the Trump administration’s goal of “zero oil exports” or “as close to zero as possible” by the deadline was not feasible, as a number of states, including Iran’s largest oil customers China and India rightly opposed the U.S. unilateral measures and said they would continue imports after the deadline. U.S. Secretary of State Mike Pompeo announced that those two states, along with Italy, Greece, Japan, Turkey, Taiwan, and South Korea, were granted waivers that allow them to continue purchasing oil from Iran at reduced volumes. Under the Fiscal Year 2012 National Defense Authorization Act (NDAA), which went into effect Nov. 5, states importing Iranian oil are subject to penalties unless granted a waiver. To be eligible for a waiver, states must make a “significant reduction” in oil imports every 180 days. The president must also certify that the oil market can absorb the resulting reductions. Pompeo did not specify in his press conference what the “significant reduction” was for each waiver (unlike the Obama administration, which set it at about 20 percent, the Trump administration evaluated each state on a case by case basis), but Bloomberg published waiver information for several states affected. South Korea, for instance, will purchase up to 200,000 barrels a day of condensates, down from an average of 300,000 barrels per day in 2017. India will be limited to 300,000 barrels per day, down from 560,000 in the first half of 2018. China’s waiver permits 360,000 barrels per day, down from an average of 658,000 in early 2018. Pompeo noted that as a result of the sanctions, 20 countries completely eliminated imports of Iranian oil and the United States has taken more than one million barrels per day of Iranian oil out of the supply chain. Pompeo called the exemptions “temporary allotments” said the goal is to get all eight nations to zero, but given the tightening oil market and opposition to U.S. unilateral measures, states are expected to continue to push back against U.S. restrictions. Iranian officials have made it clear that Tehran does not view U.S. sanctions as a deterrent to future sales. Iran is reportedly considering selling oil at reduced rates and Iranian President Hassan Rouhani said Nov. 5 Iran will “proudly” break U.S. sanctions and described the exemptions granted by the United States as a “victory” for Iran. If Iran is able to continue selling oil, it has greater incentive to fully implement the JCPOA and Iran may be willing to try and wait out the Trump administration in hope that the next president will bring the United States back into compliance. While Iran is able to continue selling oil to states that receive exemptions, the NDAA measures also target payment for oil so future purchases will mostly be made in local currencies and held in those countries. Iran can draw on the money held in those accounts to purchase non-sanctioned goods. The Nov. 5 measures impacting Iran’s oil sector also include sanctions from the 1996 Iran Sanctions Act, which mandate sanctions on transactions related to Iran’s energy sector. However, many of the companies pursuing projects in Iran’s oil and gas fields pulled out of Iran before the Nov. 5 deadline, including the French energy company Total, which was denied a U.S. waiver to continue its $4.8 million project to develop a gas field in Iran. The Trump administration did issue waivers to allow critical, JCPOA-mandated nonproliferation projects at Arak and Fordow to continue. Failure to do so would have been a serious “own goal” for the United States. The waivers were necessary because foreign entities are working with the Atomic Energy Organization of Iran (AEOI), which the United States returned to the sanctions list Nov. 5. This is a positive step for nonproliferation and contributes to full implementation of the JCPOA. 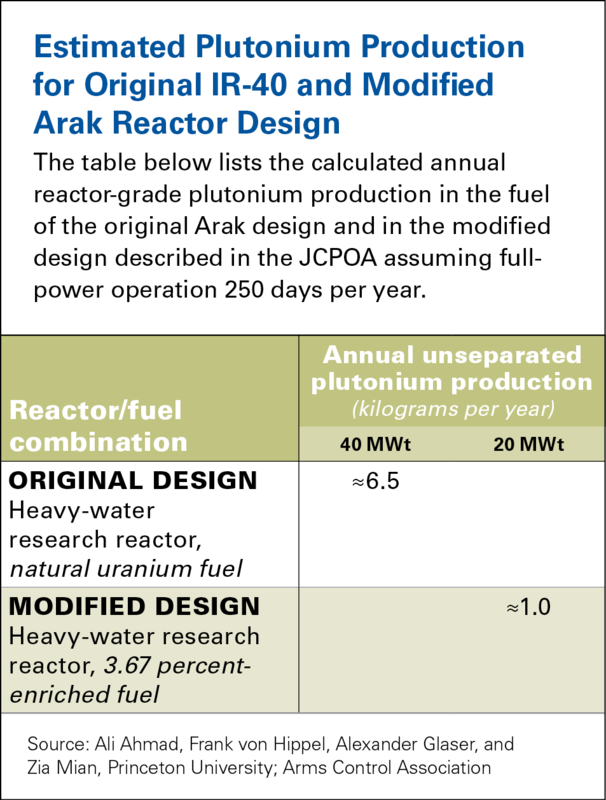 Under the terms of the JCPOA, Iran must modify its unfinished heavy-water reactor at Arak so that it produces significantly less weapons-grade plutonium on an annual basis than is necessary for one nuclear weapon – under the original design the reactor would have produced enough for about two nuclear weapons. Iran already removed the core of the reactor and China is assisting with the conversion work, as is the UK, which took over the U.S. role after Trump withdrew the United States from the deal. Fordow, which served as a uranium-enrichment facility before the JCPOA, is being converted to a research and medical isotope production center, with Russian assistance. Additionally, failure to allow these projects to continue would have put the remaining parties to the deal – the European Union, China, France, Germany, Russia, and the United Kingdom – in violation of the accord. That may have given Iran an excuse to walk away from the agreement. One of the open questions heading into the Nov. 5 sanctions deadline was how SWIFT, the Brussels-based financial messaging service used by banks worldwide, would respond to U.S. sanctions targeting Iranian banks. A group of senators even threatened to move forward on legislation targeting SWIFT if the body did not comply with the U.S. request to cut off Iranian banks. As part of the Nov. 5 announcement, the Treasury Department re-designated entities removed from the Specially Designated Nationals and Blocked Persons (SND) list under the JCPOA and added another 300 to that list, including a number of Iranian banks. The Trump administration has pressured SWIFT to expel Iranian banks designated Nov. 5, and it appears that body has caved in to U.S. demands. SWIFT is not obligated to comply with the U.S. request, but announced Nov. 5 it would again disconnect some Iranian banks from its system. SWIFT said its decision to suspend Iranian banks was “regrettable,” but necessary to maintain stability in the international banking system. That will likely be enough to stave off U.S. sanctions. In 2012, SWIFT took a similar action and at the urging of the EU, cut off Iranian banks designated by that body. Those banks were reconnected to the SWIFT system when the JCPOA was implemented in January 2016. The pressure put on SWIFT to cut off Iranian banks may serve Trump’s agenda in the short-term. But with growing international frustration over U.S. extraterritorial sanctions, which states view as infringing upon their sovereignty, it may accelerate alternative mechanisms that do not rely on the U.S. financial system. That would damage the utility of U.S. sanctions in the long run. While the waivers granted for oil sales and nuclear cooperation projects detailed by the JCPOA will positively contribute to sustaining the nuclear deal, the Nov. 5 sanctions will have a negative effect on Iran’s economy and reduce the sanctions relief envisioned under the deal. The commitment of the remaining parties to the JCPOA (EU, China, France, Germany, Russia and the United Kingdom) and to developing options to sustain legitimate trade with Iran sends an important message of political support, but it will not make up for revenue lost due to the U.S. sanctions.